Islay, a small Island off the west coast of Scotland is well known for its many many whisky and gin distillates and incredible scenery. So near the end of the summer Jess and I packed our camping gear in the car and set off in search of a gin distillery and some incredible camping spots. What we found was so much more, from cliffs, caves and wildlife to stunning beaches and perfect gin we left in love with this tiny Island and can't recommend it enough for all to visit! Words and photos just don't do this island enough credit so Jess and I decided to throw a video together in 4K UHD to really let you see how stunning this place is. Check it out below and feel free to subscribe to our new youtube channel "McTravelers" for future videos. We had no idea which tent to buy when we started out so we just copied our pals, which turned out to be a great decision. If you're just starting out with camping and looking for a great lightweight and well-built tent I can't recommend our two person Vango tent enough. You can buy one from Go-Outdoors for around £200 which may seem steep but the quality is well worth it! Click here for more info or to shop our tent. 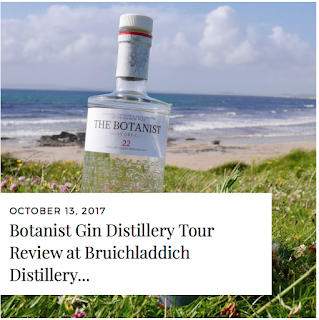 If you liked this and want to find out more than why not check out my blog post on our Distillery tour at Bruichladdich Distillary the home of Botanist Gin.